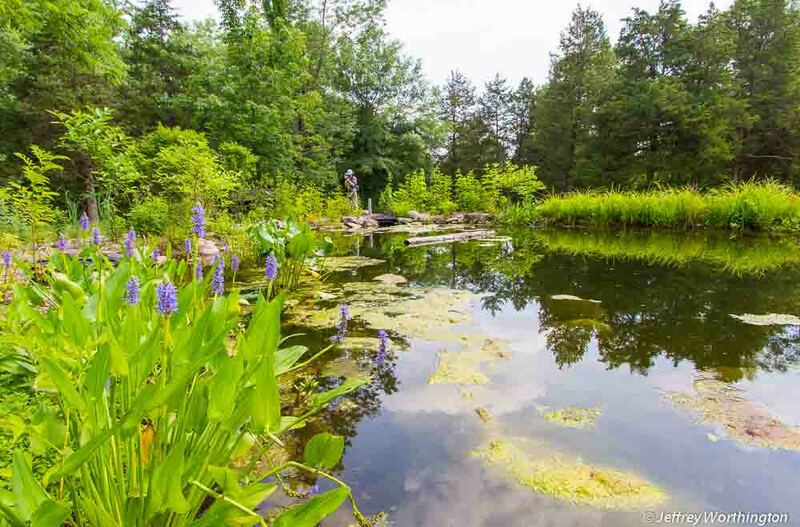 Plants are still filling in at the new pond at Bowman’s Hill Wildflower Preserve, but already the habitat is hospitable enough to tempt a variety of visitors. As you approach the pond’s edge, insect-sized American Toads (Bufo americanus) leap for shelter, escaping certain death from being squashed by a foot. They hide in the grasses, mulch, or under a plant leaf, hoping to remain unseen and unharmed. 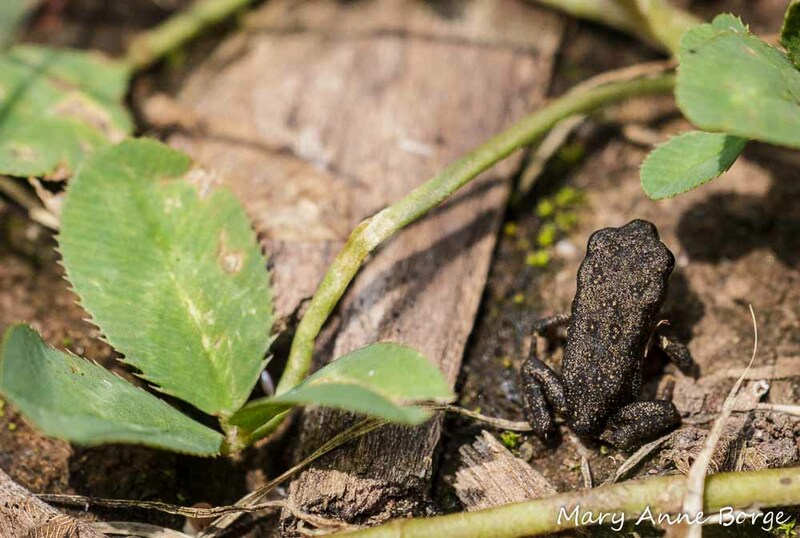 Compare the young American Toad with the clover leaves in this photo to get a sense of this tiny amphibian’s size. Another not-fully-grown visitor along the pond’s edge is this pre-historic-looking Marbled Grasshopper (Spharagemon marmorata) nymph. The flowers blooming near the pond’s edge are an attraction for many interesting animals. Elderberry (Sambucus canadensis) flowers don’t produce a lot of nectar, but they attract insects that feed on their pollen, like the wasp-mimicking Toxomerus marginatus feeding here. 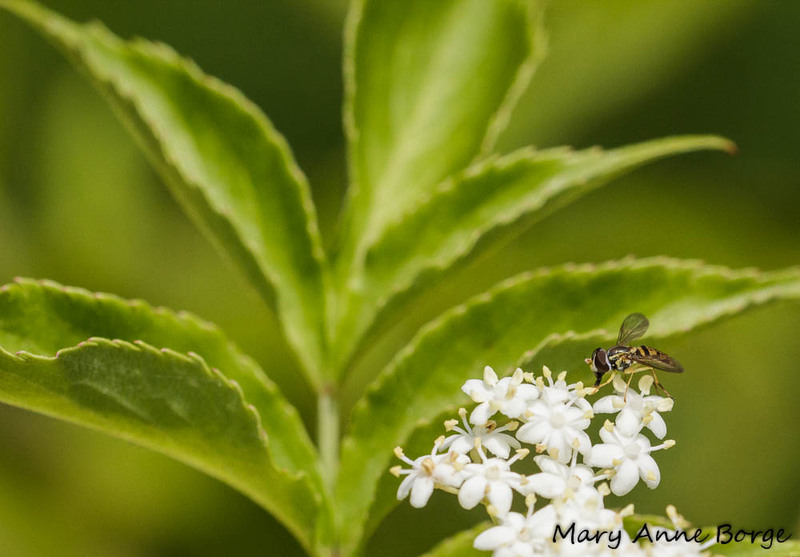 This fly species doesn’t have a common name other than Flower Fly or Hover Fly, terms used to describe species of the Syrphid (Syrphidae) family because they make their living feeding on and pollinating flowers, and many are able to hover continuously for long periods. Members of this insect family evolved to look like bees or wasps, since this threatening disguise helps them to avoid predators. 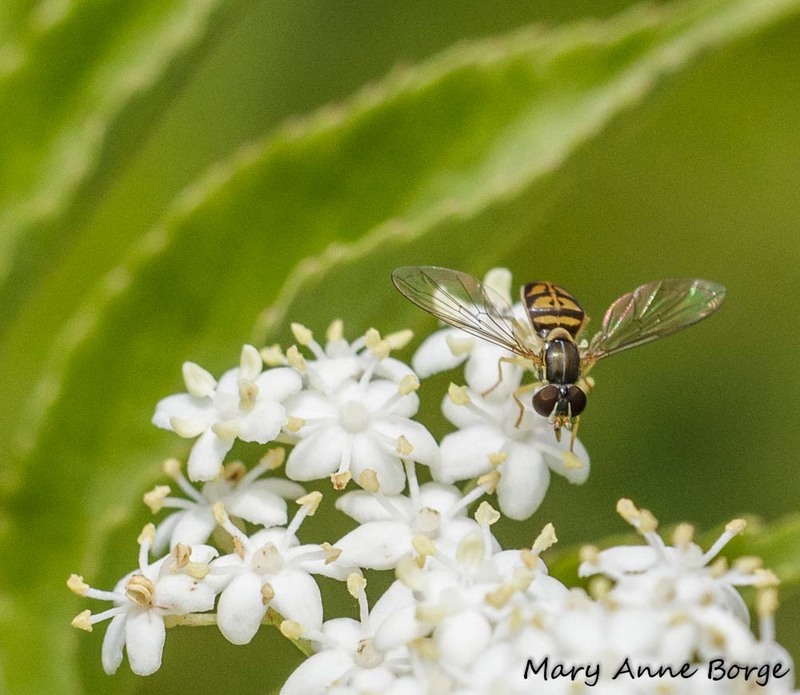 They feed on nectar or pollen, but their visits to the Elderberry flowers for food for themselves will also result in pollination, producing dark blue fruit later in the season. but they have many other visitors. Butterflies also enjoy their nectar, although their anatomy and feeding techniques are much less likely to result in pollination. 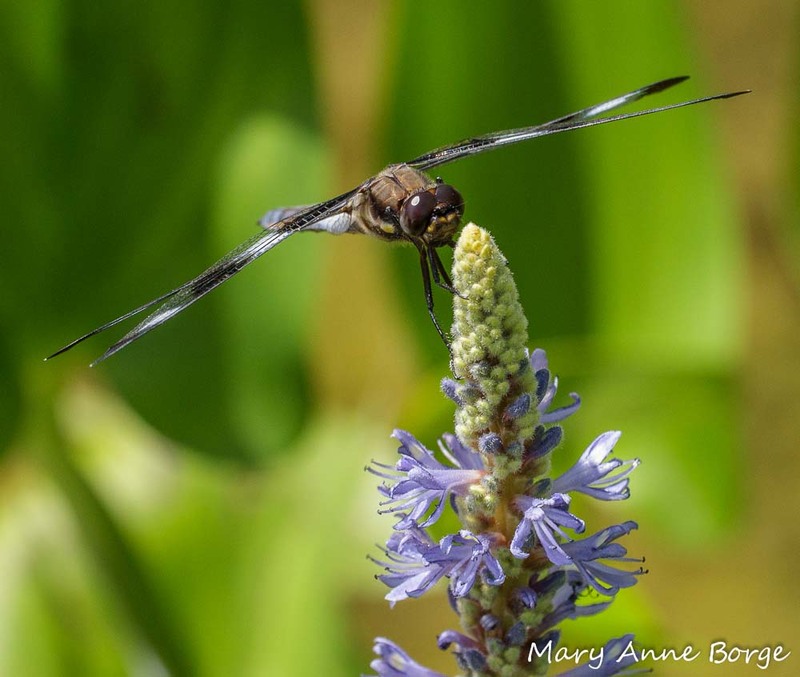 The airspace over the pond sees heavy air traffic from dragonflies and damselflies, constantly darting back and forth, feeding on other insects while both are in flight, and cruising for mates. What amazing flight navigation precision! Some females can be seen repeatedly touching the surface of the pond with the tip of their abdomen (the long slender body part that might look like a tail). 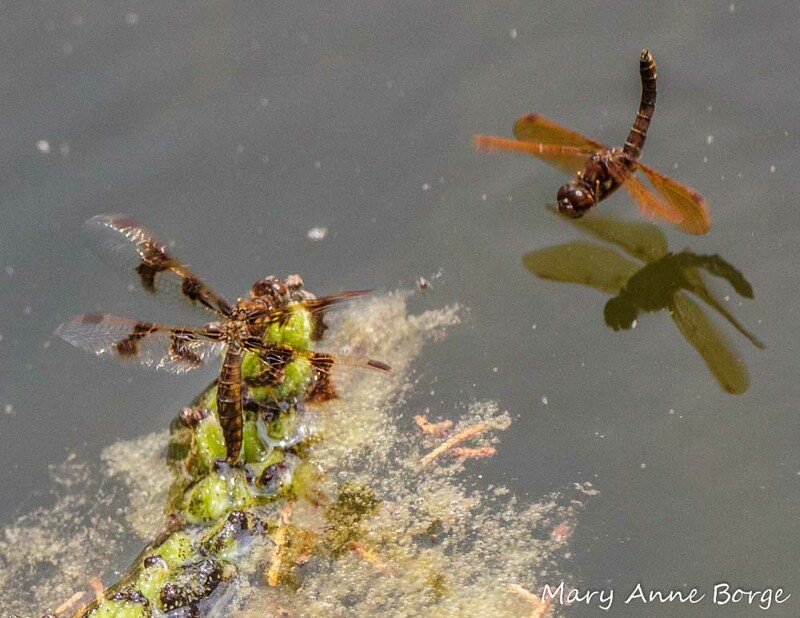 This is how some dragonfly species lay their eggs. 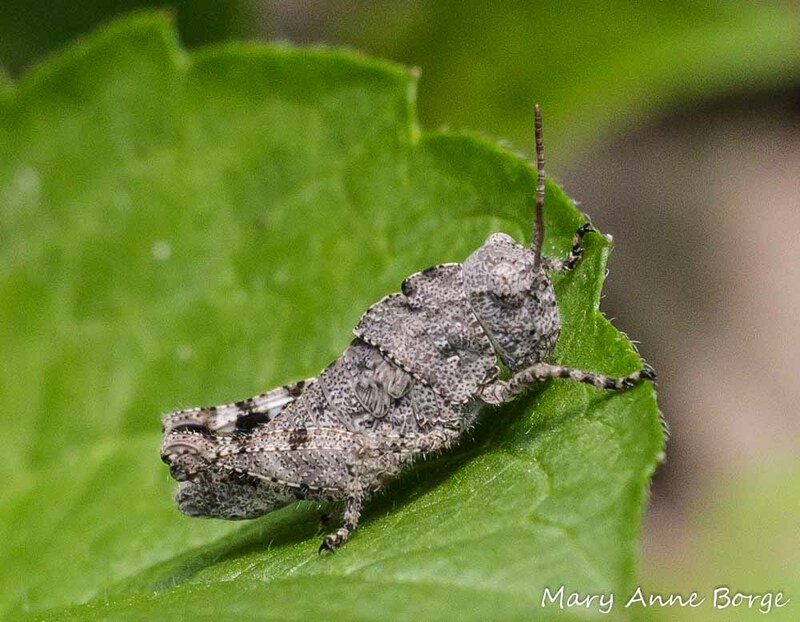 The best chance to get a close look at these busy creatures is when they pause for a break on leaves, grasses or other plant matter or surfaces, while watching for potential mates or meals. Photography helps to enable a careful enough study to tell them apart. Can you tell them apart? 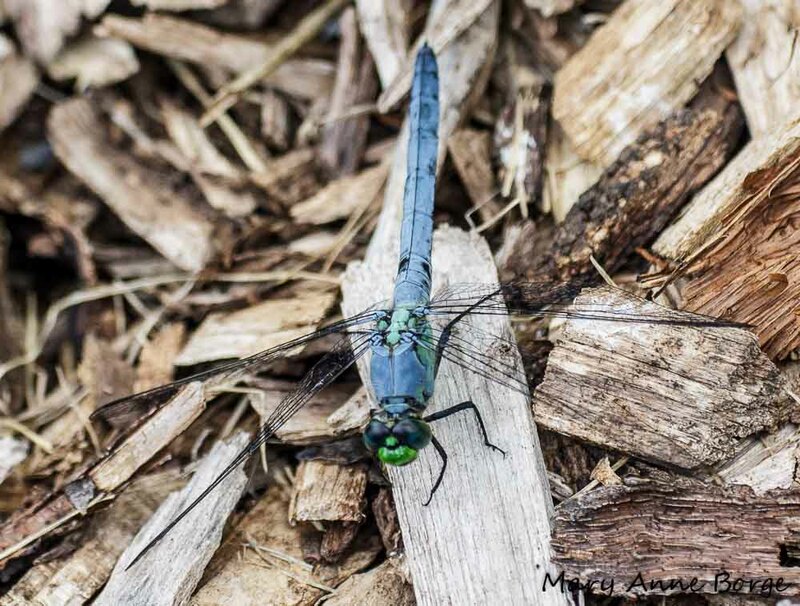 Look closely at the tips of their abdomens and count the number of segments that are blue, and check the width of the black and blue stripes on their thoraxes (the middle section of the insect, to which the wings are attached). 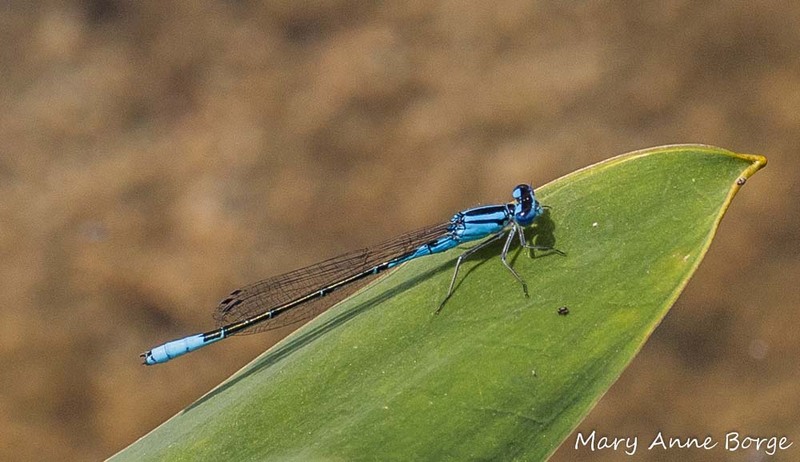 Can you see any differences between the two damselflies in these characteristics or others? 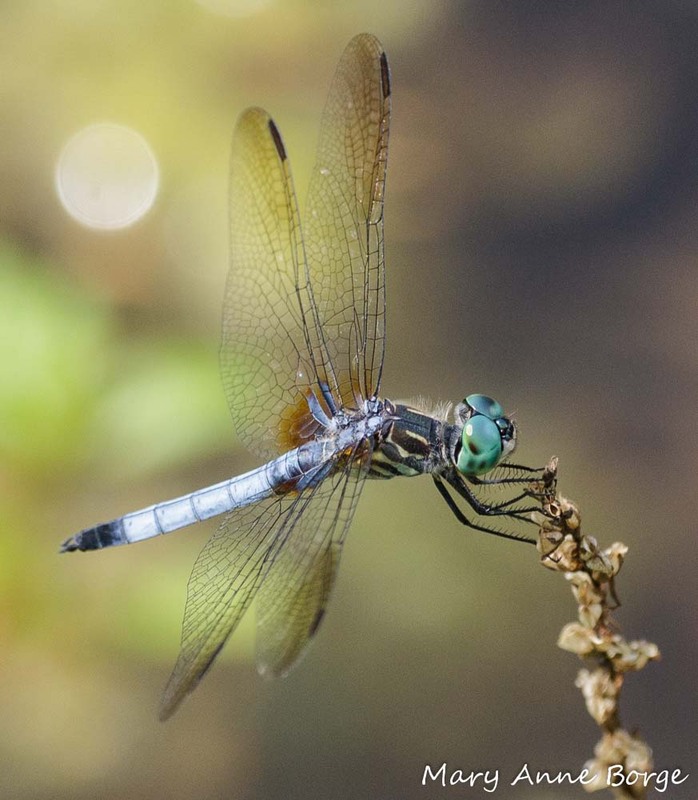 Dragonflies generally hold their wings open, often perpendicular to their bodies, but at other angles, too. 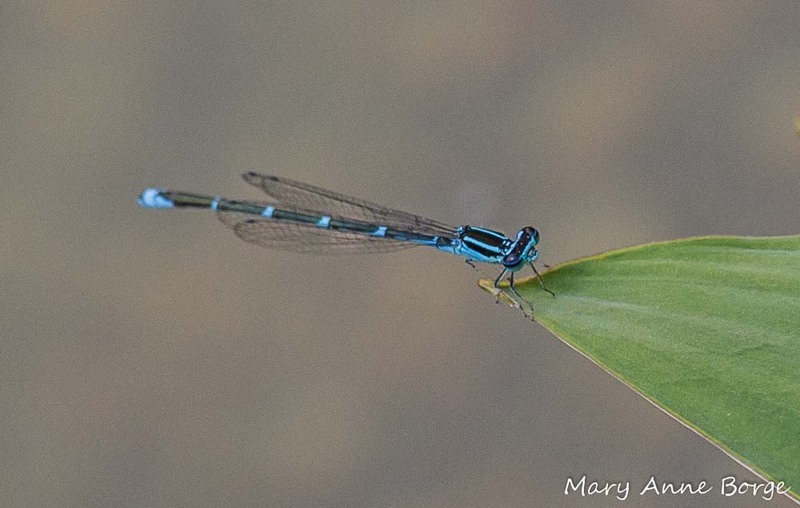 They are larger than damselflies and have stouter bodies, although different species vary quite a bit in size. 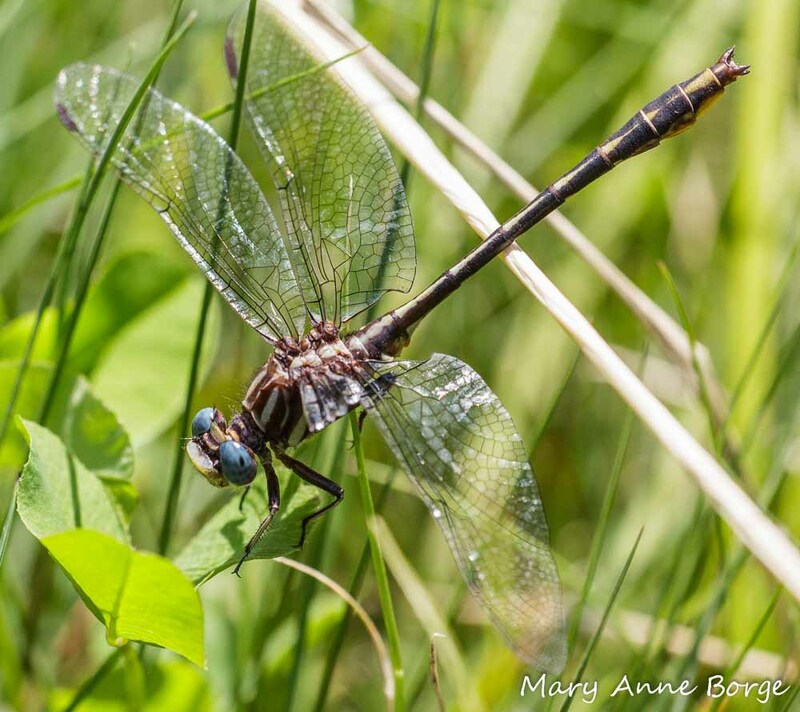 The dragonfly below is a Lancet Clubtail, resting on a clover leaf and some grasses. He’s missing a wing, probably the result of a recent encounter with an unsuccessful predator, possibly a bird, a frog, a spider, or another insect – even another dragonfly may have attempted to make him a meal. 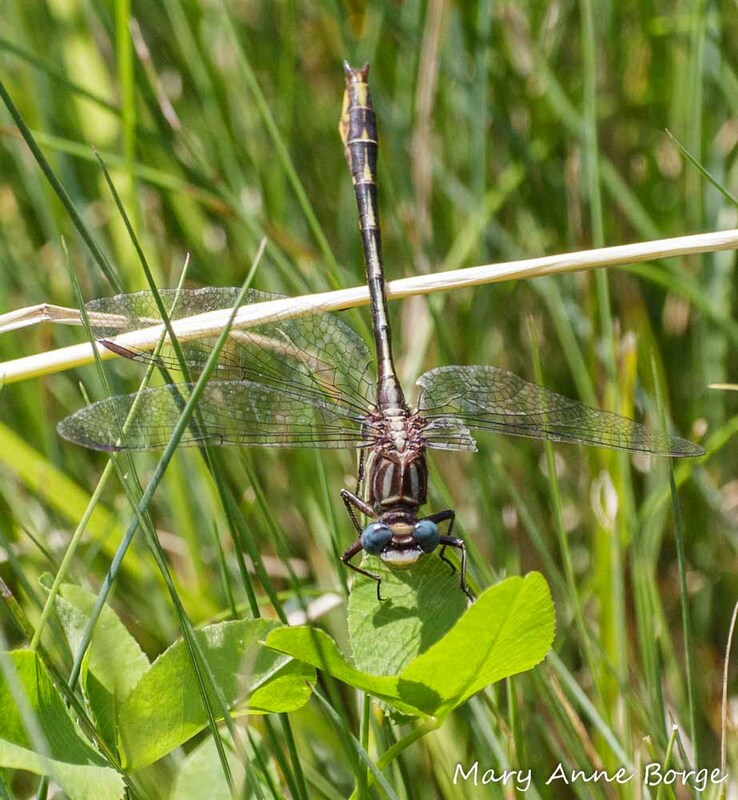 Eastern Pondhawks, like the male pictured here, are among the dragonflies that are voracious predators of other dragonflies. Male Blue Dashers spend a lot of time perching on vegetation, looking for a meal or a mating opportunity. 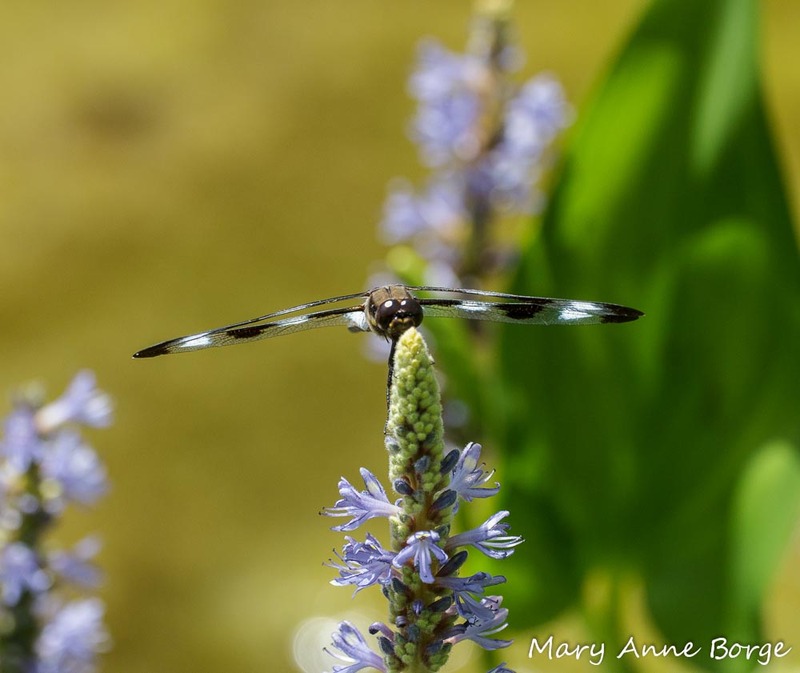 While Pickerelweed provided a favorite perch for this male Twelve-spotted Skimmer. 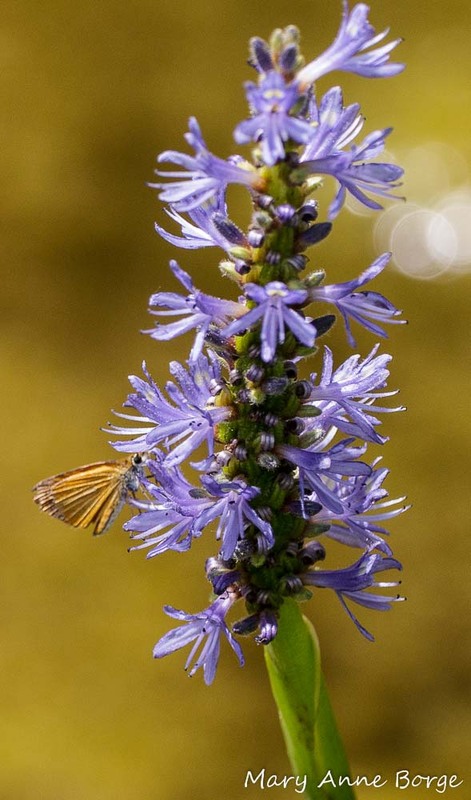 While I watched, Pickerelweed also played an important role in the courtship of a pair of Eastern Amberwings. I spotted a male first, perched a few inches above the water’s surface. 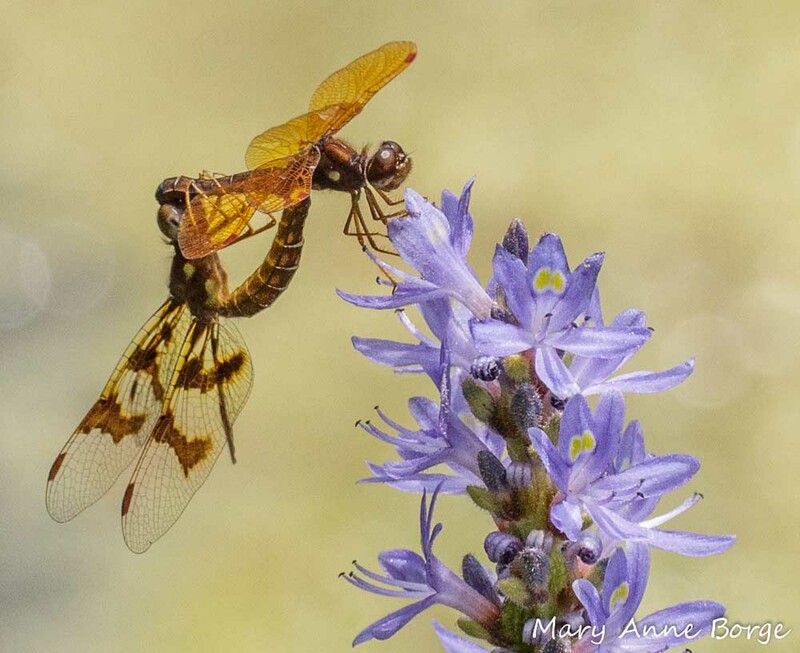 A few minutes later, I saw this pair mating at their rendezvous spot, the tip of a Pickerweed flower spike. After a few seconds they parted. 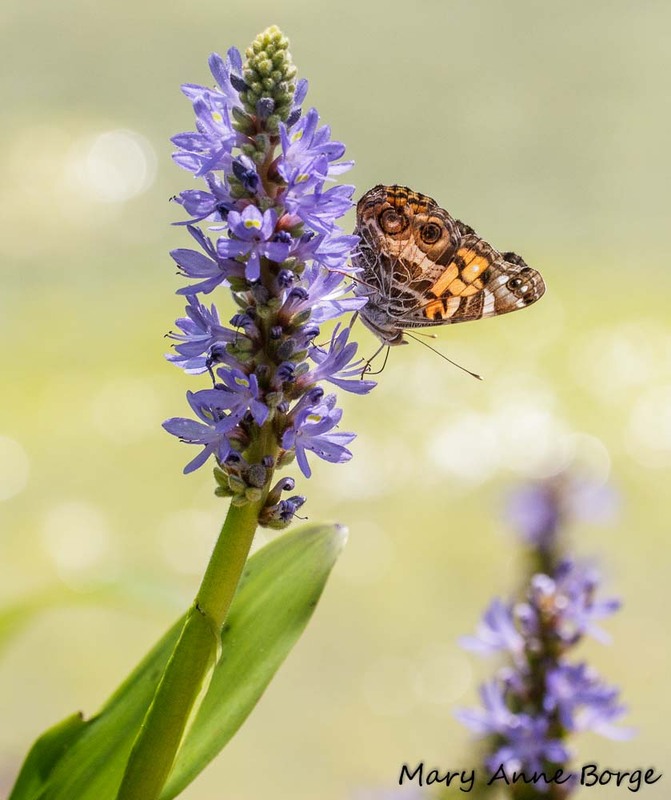 The male then led the female to a partially submerged cluster of Pickerelweed fruit, where she proceeded to lay eggs (oviposit), tapping the surface of the water while the male hovered nearby, preventing other males from undoing his efforts. Quite a show for such a new habitat! Barlow, Allen E.; Golden, David M.; Bangma, Jim. 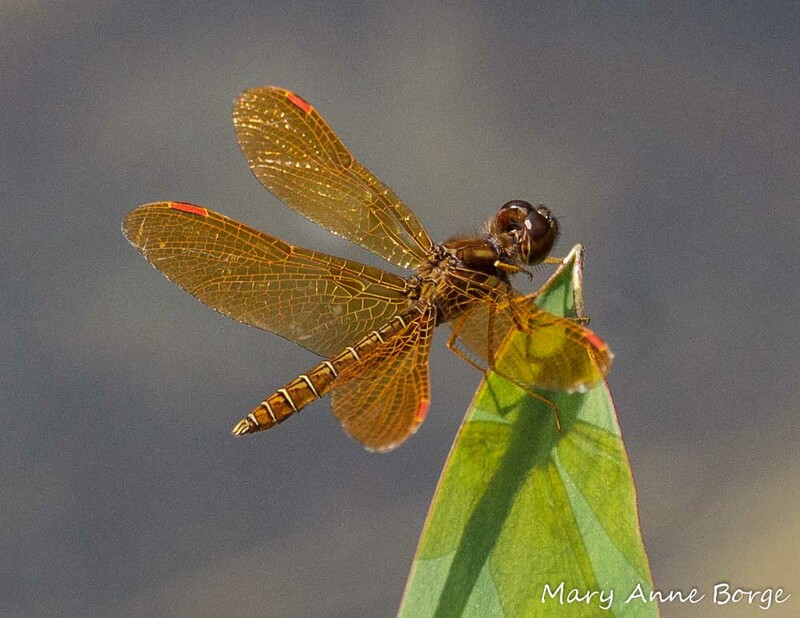 Field Guide to Dragonflies and Damselflies of New Jersey. 2009. 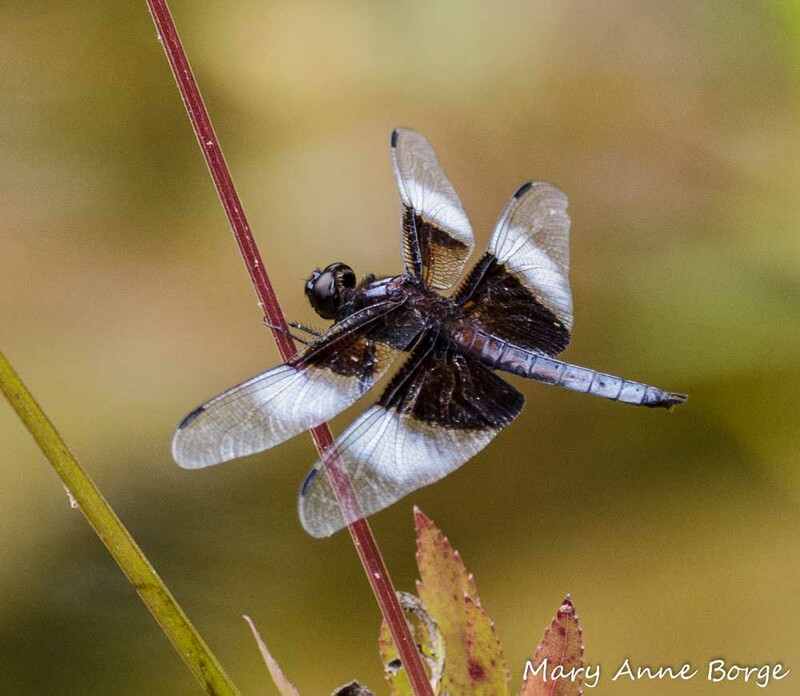 Nikula, Blair; Loose, Jennifer L.; Burne, Matthew R. A Field Guide to the Dragonflies and Damselflies of Massachusetts. 2003. 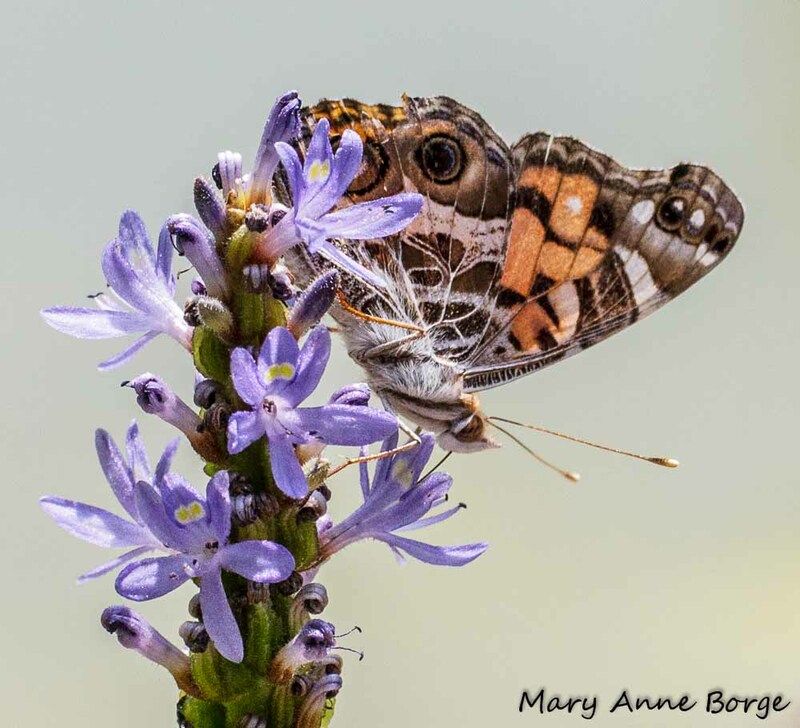 This entry was posted in Butterflies, Native Plants, Other Animals, Other Insects and Spiders and tagged damselflies, dragonflies, eastern amberwing ovipositing, eastern amberwings mating, Elderberry, nature, pickerelweed by Mary Anne Borge. Bookmark the permalink. I’m always amazed by your photos. 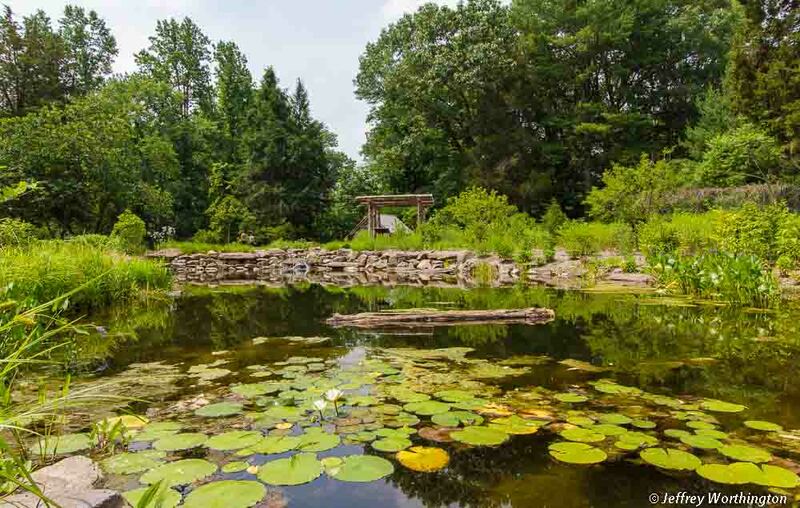 This is a great pond. Thanks, Bobbie! 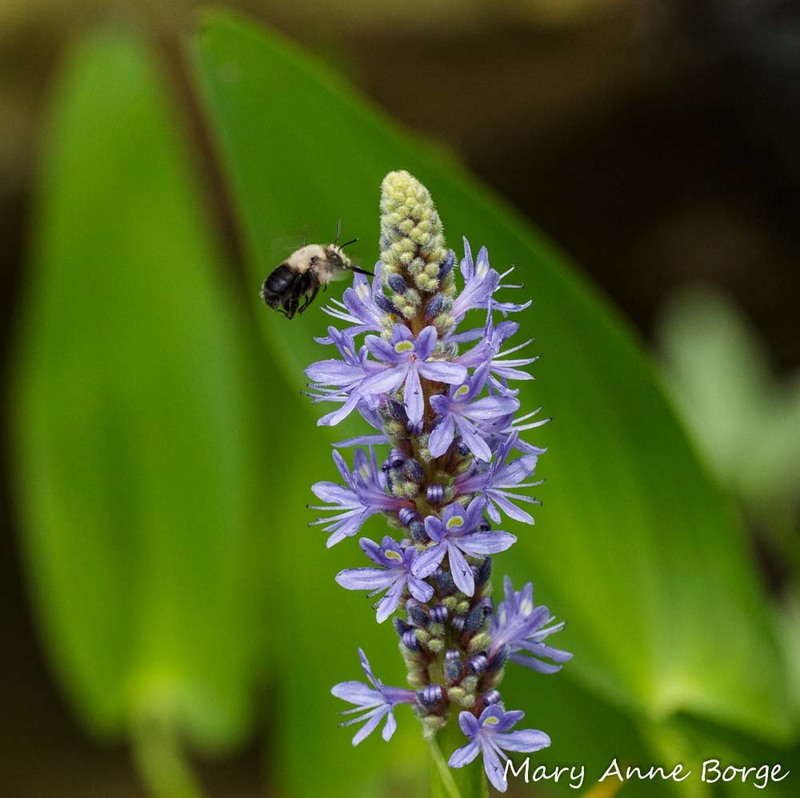 There are several Buttonbush, Mountain Mints, Blue Vervain and COneflowers that should be blooming there soon. I can’t wait to see what critters they attract! It should be good habitat for our butterfly count there later this month. Thanks, Nancy! I’ll bet your grandchildren could help us spot things we would never see on our own!